WARNING: This blog post contains some graphic photos. If you’ve visited my blog before, you’re aware that I’m not a meat-eater. Most of my recipes that I share are vegetarian or pescatarian, and sometimes even vegan. But I haven’t always avoided eating mammal flesh. I grew up on a dairy farm where beef was as prevalent as cow’s milk. In many ways we were spoiled. Our milk was free, fresh, and in constant supply. Our beef was only from cows raised on our farm in a humane way, butchered locally to our specifications, and for only the cost of processing. These helped keep a family of nine fed without breaking the bank, no doubt. Famed farmer Joel Salatin (featured in the movie Food, Inc.) speaks about keeping the food chain short and the food fresh. After college I lived in Northern Ireland with a group of international volunteers–3 of whom were vegetarian. For that year I ate from a dining hall that always had a vegetarian alternative to the meal being served. After a while, I started tasting from the vegetarian dishes and liked most of what I tried. A year after I returned to the states, I gave myself the challenge to go vegetarian for a month to see what it would be like. Living on my own, I hardly ate meat anyways, since it tended to seem like extra work to prepare something for just one. The month was successful and I realized I didn’t miss the meat. I found myself trying new recipes and experimenting with vegetables I had never even heard of growing up on the farm. So I started calling myself a vegetarian. My family, of course, has not been converted. (Including the husband). And that’s ok! I’m not an angry or vigilante vegetarian. And I’d rather anyone choosing to eat meat to know where it comes from. My family recently took this to a new level. 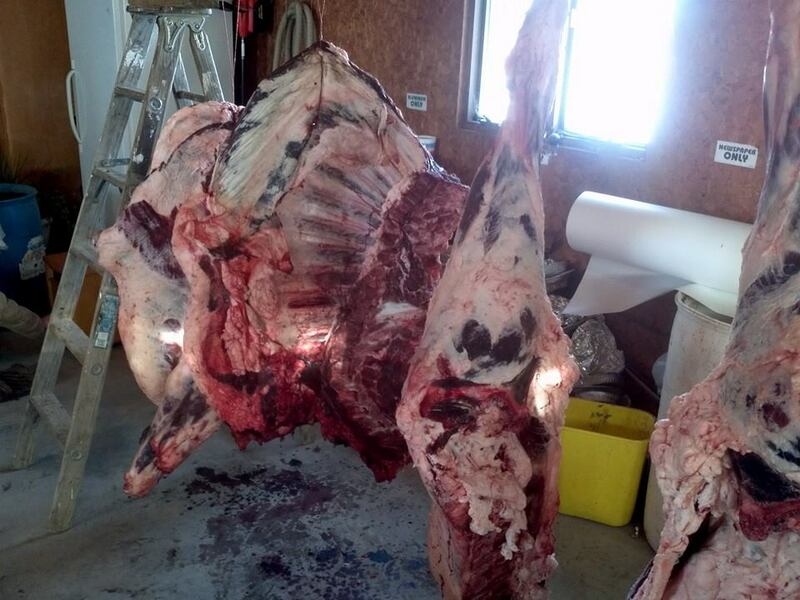 Not only was the steer born and raised on the family farm, it was also butchered on the farm. 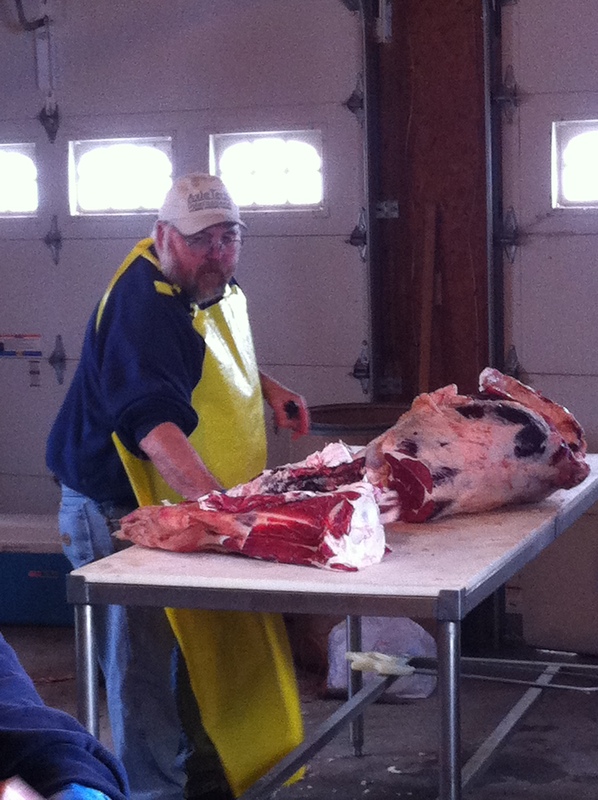 My parents hired a man to come out and kill, skin, gut, quarter, and hang the beef. It hung in the garage for 10 days. 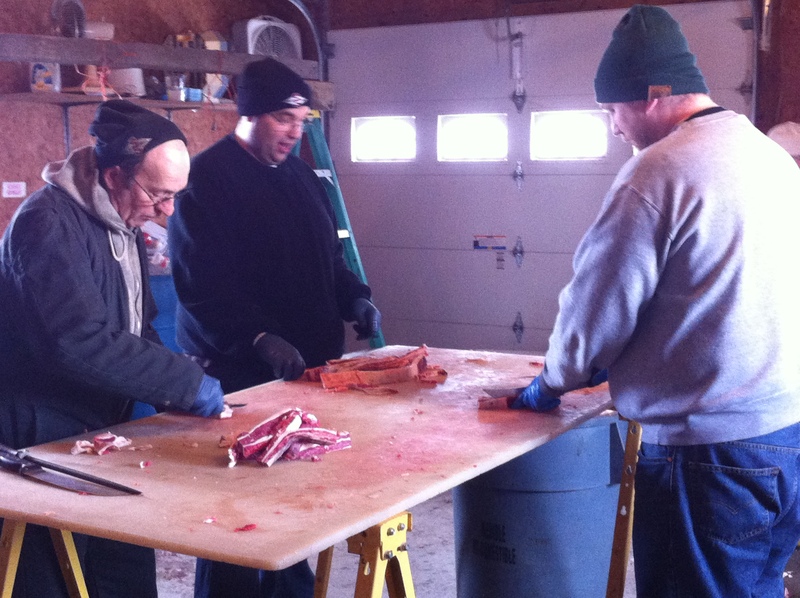 After those 10 days, the hired butcher and the extended family (my siblings and their families) came together to cut, process, and package all of the beef. 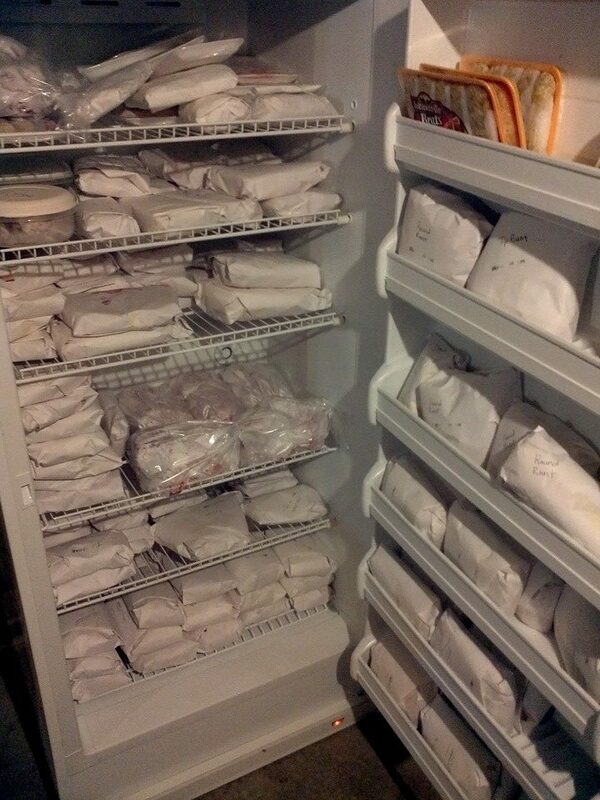 By the end of the day, all of the extended family had packages of steak, ground beef, hamburgers, roasts, and more to take home and eat for the better part of a year. I opted to support the operation by playing with my nieces and nephews in the house, which I felt was more than fair considering I wouldn’t be eating any of the beef. But I was proud of my family members for being willing to be involved in the process. I heard more than one helper comment that they don’t wish to help butcher a cow again anytime soon, but that they would do it again the next time they needed beef. In my mind, those willing to consume animals should be willing to show the animal the respect of being involved in the process of butchering. I think Joel Salatin would agree with me. When all of the nasty work is done behind the closed doors of processing plants, it’s easy to let ourselves ignore the death, blood, and guts that are required to provide us with the food we want for $2 through the drive-through. To open our eyes to the entire journey our food takes to get to our plates gives us the opportunity to appreciate and value our food appropriately, particularly when it comes to meat. So true, Marian. It’s so important for everyone to consider the source of their food and the production system used to grow/raise/process the food. As I see it, the animals that provide food are living creatures given to us as a gift, not an industrial input/output. They deserve respect and humane treatment, even (especially) in the slaughter process. I say this not because I “worship” animals, but because I’m a human who’s been given responsibility for caring for and stewardship of all of creation. I’m not a vegetarian, but I don’t eat much meat. Maybe 8 oz. a week, some weeks no meat. Almost never eat poultry–2-3 times a year. Pork consumption is also occasional and limited to pastured pork (raised by local farmers). I do eat a lot of fish and shellfish but only wild-caught from sustainable fisheries or Alabama-raised catfish. 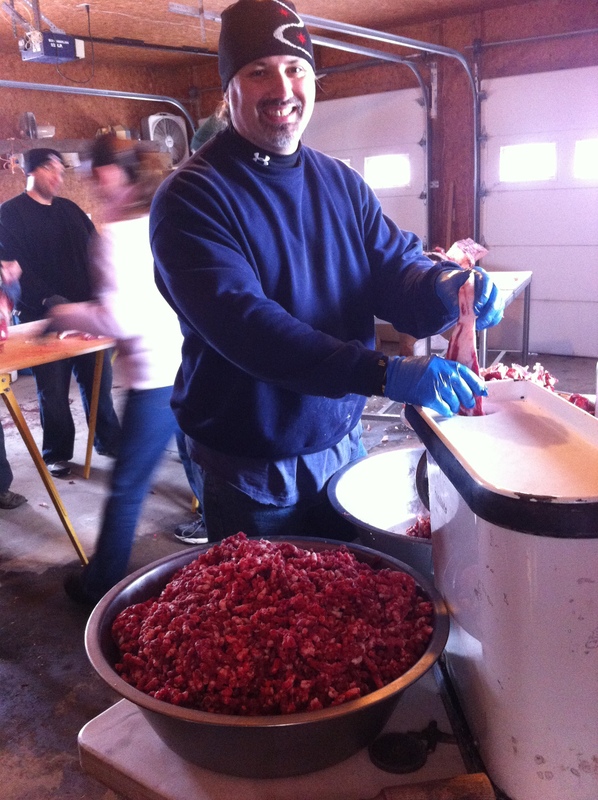 In the past few years, my main source of meat has been venison from deer that live on our farm or nearby family land. My uncle and cousins are the hunters and are careful in their deer management practices. All deer killed gets processed for food, so it’s not about trophies or such. Food choices will and do change when the consumer experiences production. It’s so important to do more to bring awareness. Thanks for all you’re doing to spread this message. Thank you, Sheree! It’s great to hear from you, and I always find it interesting to hear how others make sense of animal treatment and the consumption of meat. I ate my share of deer sausage growing up, courtesy of uncles. Certainly sustainable in this part of the world! Thank you for reading and commenting and take care!